Here are my top ranked games in The Legend of Zelda series! With classic Nintendo timing, not one but two Zeldas were released in 2001 – at the end of the original Game Boy’s life, directly before the launch of the Game Boy Advance. If Nintendo seemed like they had no idea what they were doing business-wise, at least Capcom’s Flagship, tasked with design duties, understood how to craft new Zelda experiences out of the old Link’s Awakening template (more on that in a minute). Capcom squeezed every last puzzle from Oracle of Ages’ gameplay hook of manipulating time, with Link warping between past and present, tackling time travel paradoxes. And with Oracle of Seasons, the puzzles were spatial – lakes can be crossed when frozen in winter, vines sprout and can be climbed in summer. Basically, it’s all good stuff. Highlight – Jabu-Jabu’s Belly – to get there you’ll need a head for time travel (islands drift between past and present). In the dungeon itself, you’ll need keen spatial awareness to raise and lower water levels, solve puzzles that span multiple floors, and dive beneath the water’s surface. Ocarina of Time’s Water Temple? A gentle training mission compared to this. As much as I love The Wind Waker, this one was clearly unfinished, with a camera that’s more fiddly than the Nintendo 64 games, a sparse overworld, and dungeons that are too straightforward. Nintendo’s rush in getting The Wind Waker released meant that the sailing was not as well tuned as it should have been – changing the wind’s direction is a clunky process that breaks the flow of travel (later fixed in the HD Wii U remaster). That said, The Wind Waker – thankfully, eventually – ditches the tutorials and lets you roam the seas. Whether or not you regard this Zelda as a classic depends on how much you enjoyed the sailing. 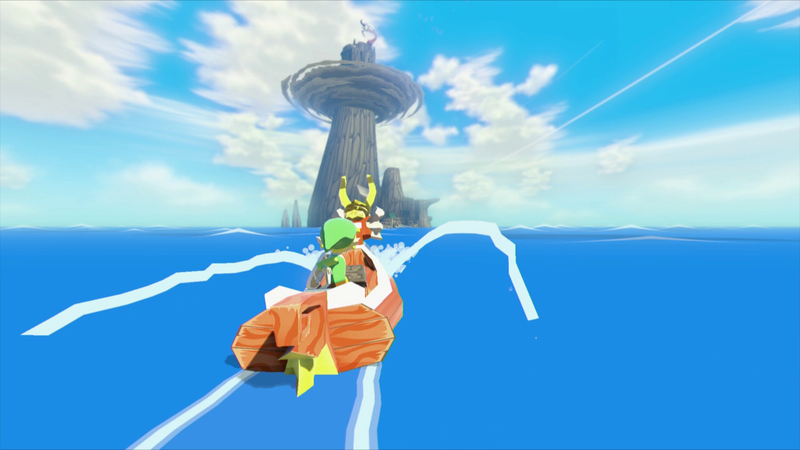 Some gamers felt The Wind Waker relied too heavily on shuttling back and forth between islands. For me, despite all the flaws, the sailing and exploration makes for a zen Zelda experience. The Wind Waker reaches greatness in other ways. Characters are cute, with dialog even more irreverent than usual for Zelda! The references to Ocarina of Time are poignant. And though mocked at the time, The Wind Waker’s wonderful, colorful, cel-shaded style make this an utterly gorgeous game to take in. Link’s oversized eyes give you visual clues – just follow his line of sight to points of interest. The Wind Waker is the most expressive incarnation of Link, and possibly the most charming entry in the The Legend of Zelda series to date. Highlight – the rocking of your magical boat on the ocean waves, the discovery and exploration of the Great Sea, the way that islands on the horizon seamlessly come into focus – sailing in The Wind Waker remains mesmerizing. Link’s Awakening stands as an amazing programming feat. How did Nintendo crunch a full fat Legend of Zelda, complete with sizable world to explore and eight dungeons that represent some of the series’ greatest level design, onto a tiny Game Boy cartridge? 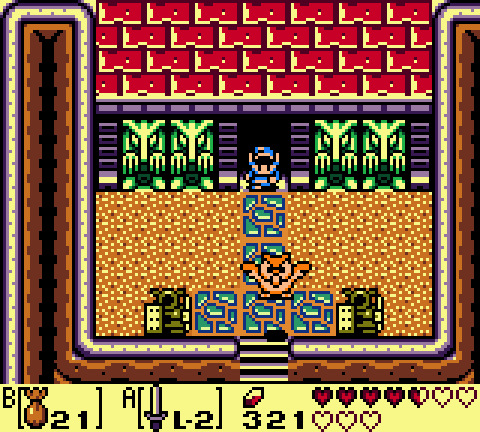 About the design: of any Zelda I’ve played, Link’s Awakening features a perfect learning curve. 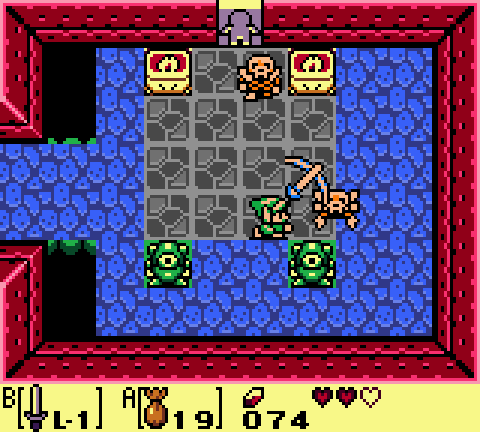 Unlike the difficulty spikes in other Zeldas (see again: the Water Temple), Link’s Awakening gradually layers on the complexity from dungeon to dungeon. As you’d expect, the first level is a gentle orientation; the final two – Eagle’s Tower and Turtle Rock – are intricate and challenging. More than the technical ambition of the game though, there was the story and theme. My retrospective on Link’s Awakening pays tribute to the game’s motif of dreams and nightmares. Here it’s enough to say that Link’s Awakening’s haunting atmosphere sticks with you, and the overworld and dungeon design are pitch perfect. Link’s Awakening: a portable epic adventure. Highlight – the game’s surprisingly deep take on the nature of reality? Superb design, like the multi-layered Eagle’s Tower? The outstanding music? There’s too many excellent components in Link’s Awakening to choose! An undeniable all-time classic. In making the leap from 2D to 3D Nintendo expertly stuck the landing. The detailed graphics, the sweeping music, the sense of adventure. The designers’ attention to detail still stands out – how the colors and tone reflect your environment, all hazy and burning red in the Death Mountain Crater, or golden green in Kokiri Forest (was Peter Jackson taking notes for The Lord of the Rings?). Remember the way your sword and shield shifted and rattled on your back as you trekked across Hyrule? Or how the dynamic music blended with the onscreen action? 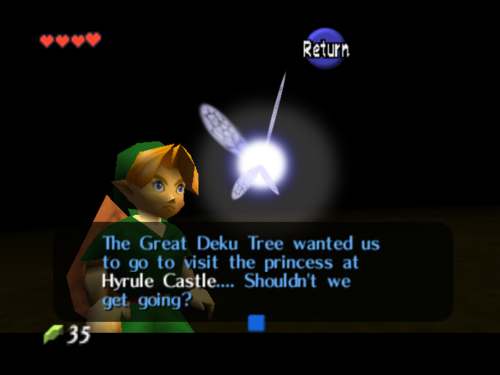 The little touches made Ocarina of Time feel like no other video game up to this point. And of course there were the groundbreaking design innovations. Nintendo, more than any other developer, realized that 3D gameplay can be inaccessible – it was easier to navigate video games when you only had to deal with up, down, left, and right in two dimensions. Their solution for a 3D world? Navi, a fairy companion, a bubbly ball of light that created connective tissue to your new environment, highlighting baddies and and providing handy hints. Even more important: Z-targeting, the ability to lock-on to a specific enemy or object, allowing for precision control. In an era in which developers were still feeling their way around three-dimensional design, this was truly revolutionary. Ocarina of Time was the first time The Legend of Zelda went 3D – and possibly the first time we experienced what 3D games were capable of. Released only two years after the first N64 title, Nintendo did not take the easy route – this is not Ocarina of Time 2. Nor does this sequel ease you into things. 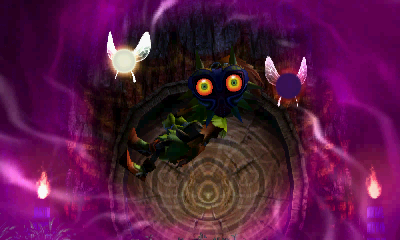 Majora’s Mask picks up with Link trapped in Termina, a dark mirror image of Hyrule. And now there’s a time limit – only three game days to prevent armageddon! 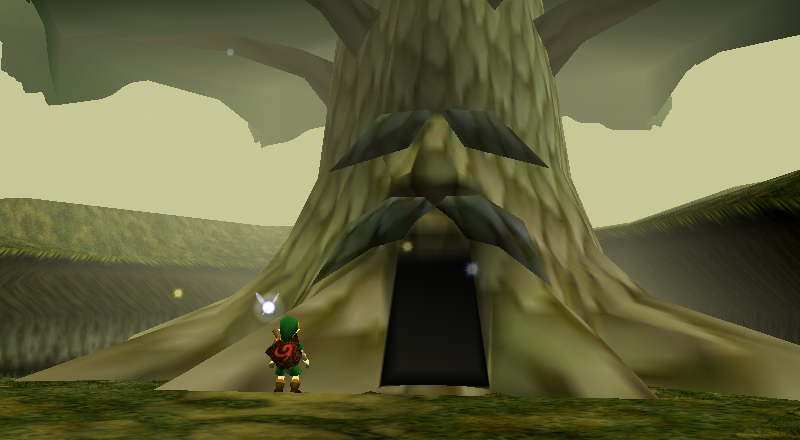 Despite a short development cycle, and design and characters reused from Ocarina of Time, Majora’s Mask is a completely unique take on the Zelda formula. Evolving a design concept first seen in Ocarina of Time, masks here provide you with the ability to swap between Deku, Goron, and Zora form, each with different abilities. And while this game is smaller than Ocarina of Time (there are “only” four dungeons, though they contain some of the toughest challenges in the series), it is Majora’s Mask’s side quests that make the game. In many ways, they are the game. In Majora’s Mask, you experience the hero’s journey where it’s not enough to be the plucky Hero of Time battling an existential evil. Although a demonic moon threatens above, the stakes are more immediate. Almost every character in Clock Town has tragedy in their life. And it’s your mission to heal them. Your actions make a difference – not in a grand sense of “saving the world” (though you do still have to save the world! ), but in simple, personal ways. 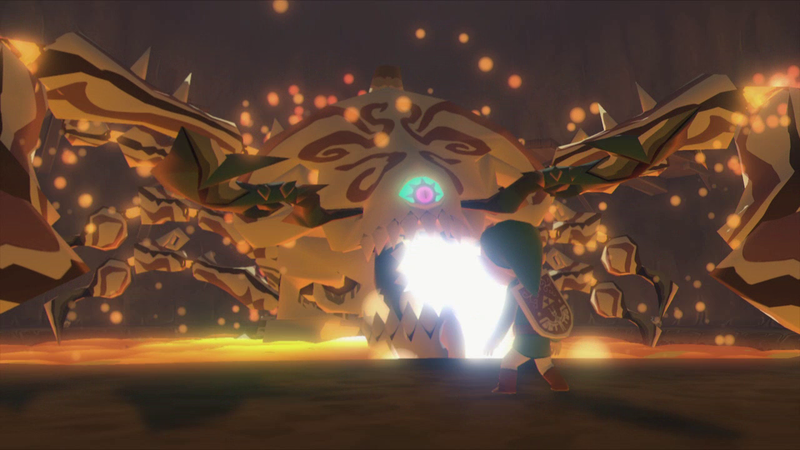 Your day-to-day interactions with the troubled townsfolk make Termina feel like a living, breathing world. 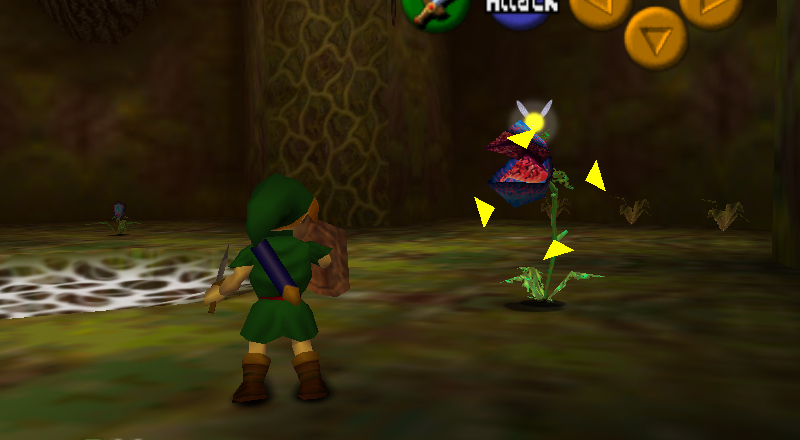 Majora’s Mask’s three days rarely feel repetitive. Each pass reveals something new about Termina’s people. The game unfolds incrementally. In what other game could waiting outside a locked door to help a lost child feel so compelling? The Nintendo team took risks with Majora’s Mask. This variation on The Legend of Zelda theme stands as an experiment that most likely won’t be repeated. Enjoy this one then, folks. Majora’s Mask shook up the Zelda formula, cranked the difficulty, and was not afraid to be dark, surreal, mournful. 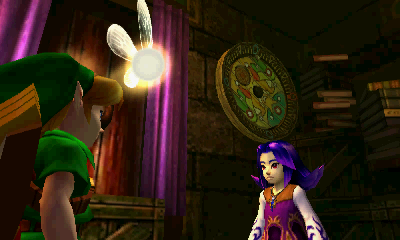 Highlights – at the emotional core of The Legend of Zelda: Majora’s Mask is the Anju/Kafei relationship. 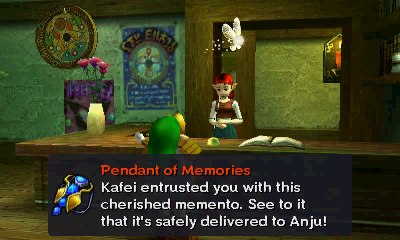 Anju is the innkeeper; her fiance, Kafei, has been transformed into a child by the Skull Kid. Your efforts to save the tragic couple before the moon comes crashing down show The Legend of Zelda at its dramatic best. See also: the finale, which mashes up confrontation, catharsis, and redemption all at once. Agree or disagree with the rankings? Share your thoughts on your favorite Zelda games below! Given Breath of the Wild, Majora’s Mask, Ocarina of Time, and The Wind Waker are my favorite Zelda games, I can’t disagree with or dislike this list. Great job! It really says something about the Zelda series that its entries have been considered some of the greatest games of their respective decades four times in a row. Many developers have come and gone within that span of time, yet three decades after the series’ inception, it’s still finding new ways to experiment with its formula. Even Majora’s Mask, which would come across as a token sequel to Ocarina of Time to the untrained eye, has a ton of innovation behind it. Thanks Red Metal, and great points! It is amazing that the quality of these games has been so high over 30 years. Very nearly every title was a landmark game in some way. I love Wind Waker, the art style alone makes it for me. Everything is so vibrant! Agreed! I am replaying Wind Waker right now, and it’s genuinely even better than I remember from the first time. It’s just such a pretty game! Great picks! I love Majora’s Mask, but for some reason it always seems to get the short end of the stick. I’m glad it made it onto your list here, and you captured it so nicely. Thanks Athena! I agree that Majora’s Mask doesn’t get enough praise. Though over the years I think it’s gone from being a bit misunderstood to being regarded as a classic in its own right. great write up, I wouldn’t agree or disgaree with the ranks, it’s almost an impossible task for those daring to try to rank this series. I think I’ve commented on part 1 of this, but when I really think about it. Even though I’m highly enjoying BOTW right now, I can easily read through each and reminisce about so many special moments from each game. Good job on why each was of these stood out in their own way. Thanks! I guess “loose ranking” would have been a better description, since I enjoyed all of these games (with maybe the exception of Zelda 2!). Each Zelda has tried to do something a bit different. Can’t wait to play Breath of the Wild! Solid rankings! I enjoyed reading your highlights too! MM, OoT, and LA are actually some of my favorite games as well, though not necessarily in that order. I’m really glad you like MM so much though. It’s a risky, emotional game, and I think it paid off, considering they could have made an easy sequel to OoT! Thanks Mr. Panda! It was hard to choose between Link’s Awakening (the first Zelda I played), Ocarina, and Majora’s Mask, but as you say, MM takes risks and is all the better for it! That’s a great description! The atmosphere of Majora’s Mask, that dark and haunting tone, really makes the game. I need to go back and try Twilight Princess again as well. I absolutely love Midna’s true form at the end. I was as speechless as LInk! I’ve played them all and it’s Breath of the Wild #1 now for me. Bloody masterpiece! I’ve heard nothing but good things – will need to look into getting a Switch sooner than I thought! Great list! Link’s Awakening is very close to the top for me so I’m glad to see it get some love. You really should play Link to the Past and Link Between Worlds if you can though! Thanks! I’ve played a bit of Link to the Past, and no Link Between Worlds, so will need to check them out. And Breath of the Wild too! Just wanted to say hello and thank you for the follow! I am following you back as well! 🙂 You have a really nice blog and can’t wait to read all your posts! Great list of Zelda games! I’ve always been partial to Twilight Princess, but they are all great games in their own right. Thank you, and thanks for the follow! I just read through both articles in this mini-series and agree with so many of your points and rankings! I’m curious – at this point, have you now played Breath of the Wild? And if so, where would you place it in your personal list? Ah, I don’t have a Switch (yet) and haven’t played Breath of the Wild (yet!) Based on the comments from Switch gamers at this point, I’m surprised by how highly it has been ranked, so maybe my top Zelda games will change in the future! Perhaps so! I definitely enjoyed the game, but honestly for me I would need more time away from it before I felt ready to decide where it falls in my personal list. Partially because, even though it was a great game, I am thoroughly tired of it and don’t even want to look at it again right now, haha. YES. I was so hoping to see Majora’s Mask high on the list! I am a Zelda obsessive, and have played all of them save a couple multiple times. I’ve always debated over Link to the Past/Ocarina of Time as which is the best but lately… I feel like I need to give the title to Majora. The 3DS remake was the exact overhaul it needed, resulting in a gorgeous game free of the tiny flaws the original had. The soundtrack is quickly becoming my favorite of the series, and just the overall atmosphere and style of the game is aging so well. Great read!